My husband is an onion-lover and could eat this salsa all by itself. 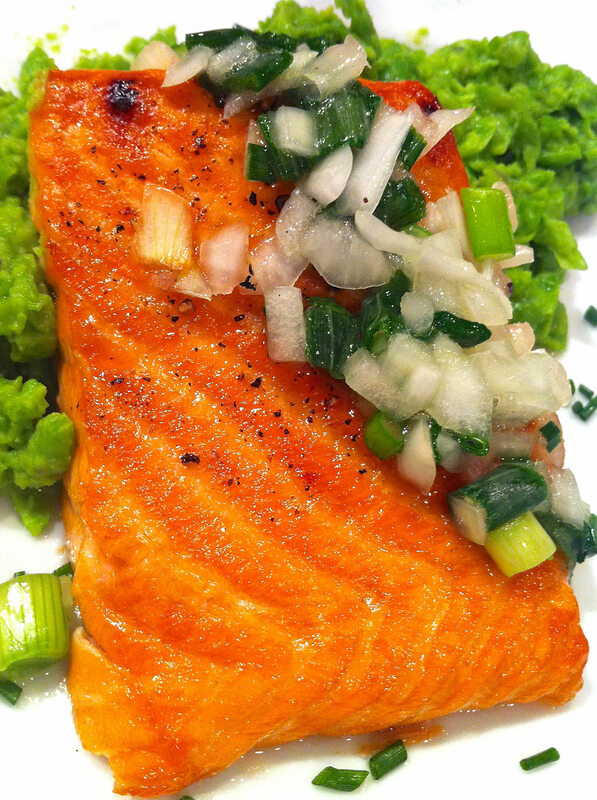 Terrific spooned over broiled salmon, it is equally good on grilled chicken or steak. Making it ahead will allow you to get this dinner on the table in minutes while giving the flavors time to blend. Serving this with Mashed Green Peas makes for a special weeknight meal and excellent entertaining fare. Place onions and scallions in a bowl of ice water for 20-30 minutes. Drain well. I like to squeeze in a clean dish towel to get rid of as much moisture as possible. Add honey, vinegar, 1/2 teaspoon salt, and freshly ground pepper to taste. Mix well and refrigerate until ready to serve. For the salmon, cover a baking sheet with foil. (If skins are still on salmon, do not put any oil or cooking spray on the foil. When finished cooking, the skin will stick to the foil and you can scoop the fish right off with a spatula!) Place fillets on foil, and sprinkle lightly with sea salt and pepper. Broil for 6-8 minutes. Time will vary depending on thickness of fillet and how well done you prefer your salmon. Don’t hesitate to cut into a fillet and take a peek. Remember that the fish will continue to cook a bit after you remove it from the oven. If the fillets are getting too dark on top but are not cooked through to your liking, either move the baking sheet lower in your oven or simply turn the broiler off and let the fish sit for another minute or two in the hot oven. Serve with Mashed Green Peas, if desired.